Nobody wants to be faced with choices when they are presented with cake (or brownies). The answer to any and all cake-related questions should be a simple ‘yes’. Now it can be. 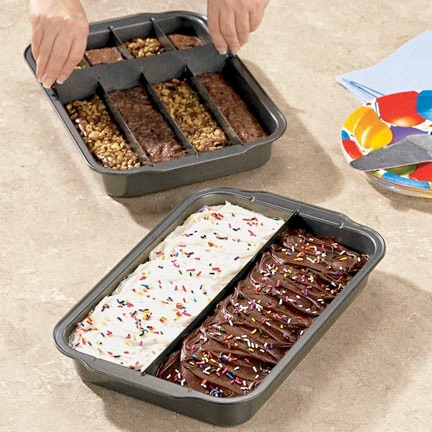 Whether you have a thing for yellow, strawberry or chocolate, the Dividable Brownie/Cake Pan can provide. Featuring three dividers that can be used (or not) to separate different batters, the customizable pan can bake up to four different varieties of cake or brownies at a time. Most cake recipes don’t usually come in sizes made for a fourth of a 13 x 9 pan, so it might be prudent to pick up four pans for four cakes. Of course, then that would negate the need for the dividers, but hey, then you would have four big cakes instead of four little cakes. Yes.